You are here: Home / Patent application process / After Filing a Patent Application / Patent Prosecution / Restriction Requirement / Does a restriction requirement disclaim non-elected species? Below, Advantek Marketing, Inc. v. Shanghai Walk-Long Tools Co., LTD (Fed. Cir. August 1, 2018) is discussed in terms of whether the scope of design patent protection is affected when electing a species in response to a restriction requirement. However, the context of the parties and how the litigation arose provides insights on how U.S. companies might better protect themselves against the danger that their own foreign manufacturer would eventually compete against them. Scroll down to the second half of this article to read my analysis of the legal issues related to election, restriction requirement and disclaimer. How to protect yourself against your manufacturer from competing against you? Foreign manufacturers are an integral part of anyone’s small business. They manufacture and supply your products that you sell in the United States. They have your tooling and molds used to make your product. What happens if one of your manufacturers decides to use your tooling and molds to make the same product and compete against you. This was the situation in Advantek. Fortunately, Advantek had secured design patent protection and was able to stop their foreign manufacturer from continuing to compete against them. The Advantek case illustrates a strategy a U.S. company might employ to mitigate the risk of a foreign manufacturer from using the tooling and molds of the U.S. company to make the same product and compete against the U.S. company. In Advantek, the accused infringer (Walk-Long) consisted of the former manufacturer (Shanghai Walk-Long Tools, Co.) and an ex-employee of the patent owner. Companies in the United States will outsource manufacturing to companies outside of the United States to take advantage of the lower wages in foreign countries. For example, many companies will seek out manufacturers in China to manufacture their products. However, with that, comes the risk that the Chinese manufacturer will copy and distribute the product here in the United States without your authorization. This is what appeared to have happened in Advantek Marketing. Fortunately, the U.S. company (Advantek Marketing) had secured a design patent on the product. When the Chinese manufacturer and the ex-employee imported and sold the same product into the United States, the patent owner’s design patent was able to stop them from continuing to do so. Below is a picture of the infringer’s product identified as the Pet Companion as well as drawings from the design patent, namely, US Design Pat. No. D715006. For the limited purpose of preventing your own manufacturer from using your tooling and molds to compete against you, a design patent could be useful. I list three other situations here in my book Navigating the Patent System. In general, design patents are easy to design around. To avoid design patent infringement, all you need to do is make the accused product look differently. For this reason, design patents are not very useful except in some unique situations such as in Advantek and the three situations I describe in Navigating the Patent System. In protecting yourself against your own manufacturer, the design patent is useful because it makes it harder for the manufacturer from using your own tooling and molds to make the same product. For the manufacturer, the cost of entry is low because they already have the tooling and molds. Plus, they already know that there is a demand in the United States for your design because of your prior orders. To make your product look different, they would presumably have to make new tooling which would increase the cost to enter the market. In this sense, a design patent might be effective in stopping the foreign manufacturer from replicating your product with your own tooling and molds to sell the same product into the United States. Moreover, because design patents are relatively inexpensive to secure compared to utility patents, design patents may in my opinion be relatively cost effective for these situations. Does an election in response to a restriction requirement disclaim non-elected species to limit the scope of the patent claims? In Advantek Marketing, the foreign manufacturer and the ex-employee (collectively, “accused infringer”) worked together to manufacture and sell the same product that Advantek Marketing was selling in the United States. The product was a pet enclosure or gazebo for a pet branded as Pet Companion. The patent owner (Advantek Marketing) sued their foreign manufacturer and the ex-employee for design patent infringement. Presumably, the foreign manufacturer and the ex-employee used Advantek’s own tooling previously used to manufacture goods for Advantek to now make their own competing product. To avoid design patent infringement liability, the infringers (Walk-Long) argued that the scope of protection afforded under the design patent was not broad enough to cover what they were selling. The design patent was for a gazebo or pet enclosure with a skeleton top and no cover. The infringers were selling the same unit with the cover on a skeleton top. 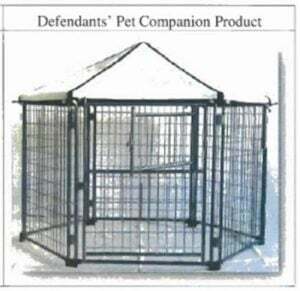 Walk-Long argued that during examination of Advantek’s design patent, the patent owner had disclaimed a pet enclosure with a cover. In particular, during examination, the examiner made a restriction requirement. See links below for more information on restriction requirements. Advantek now had to choose between 1) a pet enclosure with a skeleton top and no cover or 2) a pet enclosure with a cover. See images below. Advantek elected for examination the pet enclosure with the skeleton top and no cover. 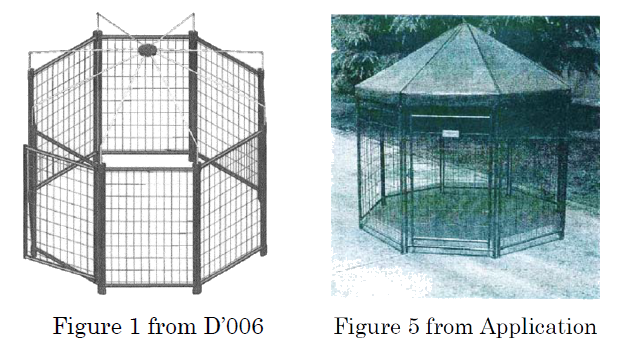 By doing so, Walk-Long argues that Advantek had surrendered pet enclosures with a cover from the scope of the design patent directed to a pet enclosure with a skeleton top and no cover. A restriction requirement is a requirement by the examiner to elect one species of the various embodiments disclosed in the patent application for examination. See MPEP 803. Many inventors become upset when they receive a restriction requirement. They feel, from a lay person’s understanding, that the way the examiner is splitting up the various features, aspects, embodiments of the invention is incorrect because the various parts of the invention is really the same thing. The infringer (Walk-Long) manufactured and sold the design shown in Figure 2 with the cover. During litigation, the infringer that the patent owner had disclaimed pet enclosures with a cover because the patent owner had elected the non-cover embodiment for examination. In other words, by electing the non-cover embodiment, the patent owner was surrendering patent claim scope that would have included gazebos / pet enclosures with a cover. The Federal Circuit disagreed. The type of argument that the infringer was making was one of prosecution history estoppel. Under Pacific Coast Marine Windshields Ltd. v. Malibu Boats, LLC, 739 F.3d 694 (Fed. Cir. 2014), prosecution history estoppel in design cases depends on three factors: 1) whether there was a surrender, 2) whether it was for reasons for patentability, and 3) whether the accused design is within the scope of the surrender. The Federal Circuit did not definitively answer whether an election in response to a restriction requirement is a disclaimer of the non elected embodiments. Rather, the Federal Circuit indicated that if there was a disclaimer, the patent owner did not disclaim the infringer’s version. In my opinion, the Federal Circuit just did not want to preclude such possibility. I’m aware of no other cases that held that an election is a disclaimer of the nonelected species which would limit patent protection either in a design or a utility case. The Federal Circuit held that Advantek (patent owner) is not estopped by the prosecution history from asserting the D’006 patent against Walk-Long and the accused infringing product (Pet Companion).